Benetech’s focus has been advising bulk material handlers on dust collection, containment and suppression for restricting fugitive dust that can endanger both plant personnel and the greater community. The airborne dust can be categorized as inhalable dust, respirable dust or combustible dust. This allows bulk material handlers to secure much safer working environments while achieving greater regulatory compliance. Benetech, Inc. is continuing to apply its research and development resources to dust-control solutions that establish material flow safety and a dust-free work environment for bulk material–handling companies. A main area of Benetech’s focus has been advising bulk material handlers on dust collection, containment and suppression for restricting fugitive dust that can endanger both plant personnel and the greater community. The airborne dust can be categorized as inhalable dust, respirable dust or combustible dust. Inhalable dust is larger, heavier particles that can often lodge in the nose, throat or upper respiratory tract. Respirable dust is smaller, finer particles that can make their way deeper into the lungs and respiratory system; they evade the body’s natural cleaning systems, such as mucous membranes. Combustible dust is flammable particles that can spontaneously ignite under the right conditions. All three forms of fugitive dust pose serious hazards to the safety of employees who work in dust-producing environments. The amount of fugitive dust that collects in the air and on surfaces determines its degree of risk, and the threat is limited only by how far the dust can travel. Beyond its risks to health and safety, fugitive airborne dust can result in damaged equipment, lost resources to correcting the dust problem, higher insurance expenses and costly regulatory penalties. 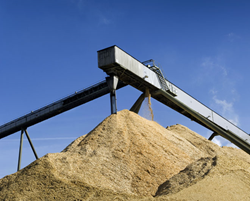 Benetech provides complete, performance-based solutions for dust mitigation and bulk material–handling systems. Its products, services and technologies reduce dust, prevent spillage, improve material flow and reinforce compliance. A partner in planning, engineering and operating dust-control and material-handling systems, Benetech helps companies assess challenges, establish priorities and achieve the results they require. For more information, please call (630) 844-1300 or visit http://www.benetechglobal.com.